You are here: Home » GENRE » Horror » 3 Classic Horrors Of The Silver Screen Vol. 7 (DVD films review). 3 Classic Horrors Of The Silver Screen Vol. 7 (DVD films review). If you want to watch rare old films then this series of ‘Classic Horrors Of The Silver Screen’ is worth investigating. I picked up the seventh volume mainly because I read about a couple of these films earlier in the year. 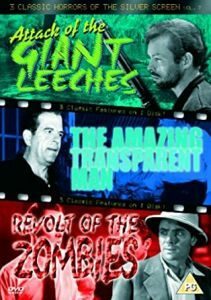 This edition of the 1959 film ‘Attack Of The Giant Leeches’ also called ‘Demons Of The Swamp’ on IMdB is scratchy at the beginning but at least it’s available and quickly be quickly noted is from the Roger Corman stable. A town by the local Florida swamp reserve has a giant leech problem. After one man is killed, the game warden, Steve Benton (actor Ken Clark) and his girl-friend, Nan Greyson (actress Jan Shephard) go out on the swamp to make sure they get everyone of the creatures but don’t spot anything. Much of the action is intrusion into normal hick life. When a tryst between Cal Moulton (actor Michael Emmet) and Liz Walker (actress Yvette Vickers) is broken up her husband, Dave Walker (actor Bruno VeSota), the two lovers are carried off into the swamp by the leeches. Walker isn’t believed by the local Sheriff (actor Gene Roth) and later commits suicide in the cells. Two hicks knowing there is a $50 reward for discovering both bodies are also taken. I should remind people that leeches like blood so tend to keep their victims alive…if they can. Those pesky humans do try to escape from the grotto. Benton resists Doc Greyson (actor Tyler McVey)’s desire to dynamite the creatures or at least bring the dead bodies to the surface but relents eventually but only the two hicks and Moulton’s bodies surface. Greyson thinks Liz is still alive. With another diver, Mike (actor Walter Kelley) waiting in the boat, Benton goes hunting for caves at the bottom of the swamp. For the rest, buy the DVD. 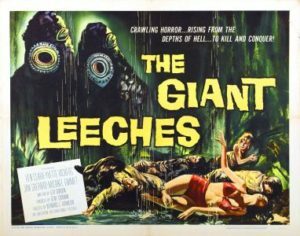 Considering it’s a Corman film, the leeches are pretty effective, mostly because you don’t see much of them. Of course, everything else is on the cheap and I could almost swear the swamp looks awfully similar to the lost lagoon but there is still an effective use of budget. Safecracker Joey Faust (actor Douglas Kennedy) is broken out of jail by Major Paul Krenner (actor James Griffith) and given a radiation treatment by Dr. Peter Ulof (actor Ivan Triesault) to make him invisible allowing him to rob a centre for radium to allow the experiments to continue. Although Faust is shown the invisibility experiment on a guinea pig, he decides to escape when he realises he’s a prisoner. Before he goes, he interrogates Ulof and discovers the scientist is forced to work because Krenner has Ulof’s daughter prisoner. They are interrupted by Laura Matson (actress Marguerite Chapman) and Faust is attempting to persuade her to help him when his recovered guard takes charge again. Krenner has Faust become invisible and the crook uses the change to turn the tables and expects to be paid after stealing from the laboratory. Krenner convinces Faust to steal from a bank during the day and finds himself becoming visible and, although fleeing, is identified later. Returning to the house to rescue Ulof and his daughter, Faust also wants to know why his invisibility fluctuates. Ulof explains that he and Faust are dying of radiation poisoning but his daughter will live. The scientist also explains Krenner’s plans for an invisible army and convinces the thief to stop his plans. 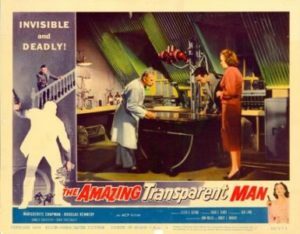 For a B-movie, the special effects of invisibility is on par with other earlier invisibility films. If anything, it’s odd how Faust’s clothes also become invisible when subjected to the ray. In many respects, the plot is naïve. I mean, why grab a safecracker when on both occasions theft was carried out, the safe doors were wide-open. The standard way is just as effective. I’m also pondering on the title but I guess Universal Studios might have objected had the word ‘invisible’ been used. During World War One, a French colonial unit is in Cambodia and the priest Tsiang (actor William Crowell) saying a platoon of zombies could wipe out the enemy. 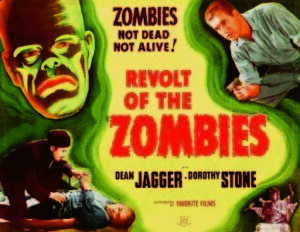 I should point out that these zombies are mind-controlled people than the type you might be familiar with today. However, the top brass aren’t happy and Tsiang is imprisoned and someone kills him. Later, an archaeology expedition into the region discovers that these zombies are not a myth. One of the archaeologists, Clifford Grayson (actor Robert Noland) find the secret and controls one of his servants but just immobilises him until he literally gives him the evil eye. These eyes actually belong to Bella Lugosi incidentally taken from a still. He slowly takes over other people, including the leader of the expedition who gives out orders to Armand Louque (actor Dean Jagger) to go on a trip. However, General Mazovia (actor Roy D’Arcy), the man who killed Tsiang, realises what is happening and by who and want to share the power but gets unstuck. Grayson takes over everyone else. Louque returns and his finance, Claire Duval (actress Dorothy Stone) is give an ultimatum by Grayson to send him away to safety and stay with him. Claire, in turn, says if Grayson really loved her, he would give up his power. He does. From there, we have the revolt. A lesson in people don’t like being mind-controlled with a moral quote at the end. Although none of these films are truly great, they are less likely to appear on your TV screens. A chance to see some ‘B’ movie classics that you would otherwise only have read about in books at least ensures they are crossed off your bucket list. « Blade Runner 2049 – new trailer brings on the cyberpunk.